AMD launched its Ryzen 5 2400G and Ryzen 3 2200G APUs only seven weeks ago, on 12th Feb. HEXUS published a review of these value processors on the day, and together they shared a HEXUS Value Award. They were praised for Intel-like energy efficiency, offering great value, and delivering a best-in-class GPUs. Our editor thought both chips could be a foundation for a decent HTC-style PC with enough CPU grunt and GPU power for entry-level gaming. To recap, these APUs are AMD's first to combine Zen CPU cores and Vega GPU cores and are AM4 socket designs with 65W TDPs. The AMD Ryzen 5 2400G launched at $169/£149. For this price you got a 4C/8T 3.6GHz CPU, with 3.9GHz Turbo, fused with a Vega GPU providing 11 CUs (704 shaders) operating at a peak 1,250MHz. The AMD Ryzen 3 2200G launched at $99/£89. For this price you got a 4C/4T 3.5GHz CPU, with 3.97GHz Turbo, fused with a Vega GPU providing 8 CUs (512 shaders) operating at a peak 1,100MHz. 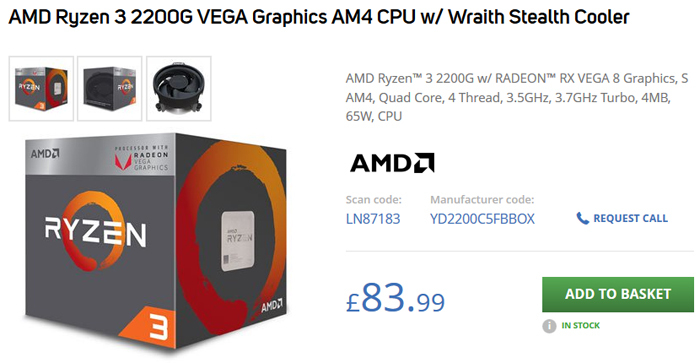 Now, as you can see above, the AMD Ryzen 2 2200G is available for £83.99. Not just at Scan, as in my screenshot above, but at various other places like Amazon UK, eBuyer and Overclockers UK. That's an approx 9 per cent price cut. Needless to say, what were already great value propositions from AMD are all the more attractive now at the thrifty end of the market where they are aimed. Given the exchange rate, these new prices are now what they should have been launched at in the first place, so excuse me if I don't feel any gratitude for the ‘reduction’. I would upgrade my HTPC in a heart beat with one of these (Current A8-7600) but then I look at ram prices and decide not to bother.